Today is my anniversary and to celebrate I'm making two special meals featuring ingredients we both love. Part one for today is breakfast: poached egg with spinach and bacon on a corn biscuit with a guajillo goat cheese hollandaise. To prepare the biscuits I mixed masa harina with butter, salt, pepper, and milk. I folded in sweet corn and baked in an oven until they were flaky and cooked through. 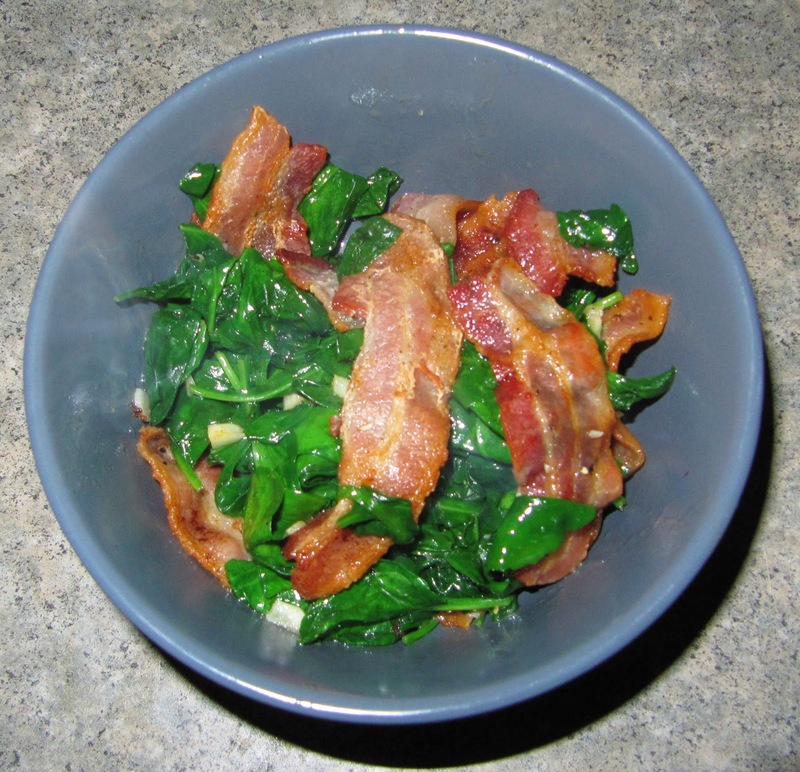 While the bicuits were in the oven I fried bacon until crispy and tossed some baby spinach in the pan to wilt. I added a bit of salt, pepper and garlic and cooked through to combine the flavors. 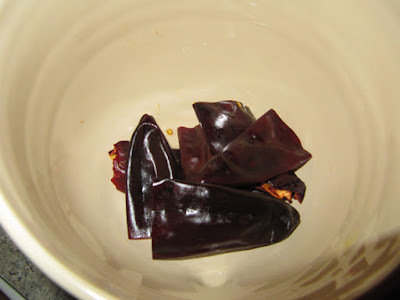 To prepare the guajillo goat cheese hollandaise I softened dried guajillo chile in boiling water. I place goat cheese, two eggs yolks and the softened guajillo chile in a blender to combine. I added some of the boiled water a bit at a time to cook the egg to thicken the sauce a bit. Finally, I poached eggs in a shallow pan filled with water and a bit of vinegar to keep the egg in tact. 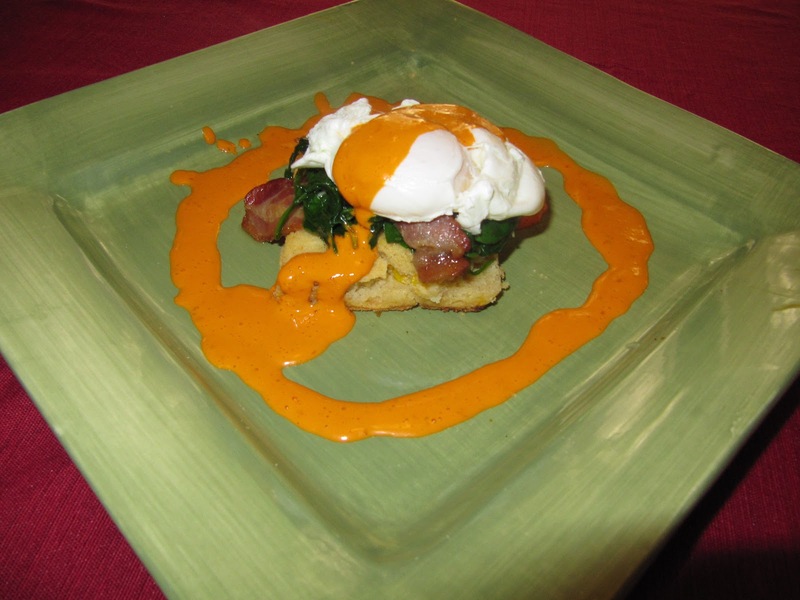 To complete the dish I placed a biscuit on the plate and covered with the spinach/bacon mixture, which I then topped with a poached egg and the guajillo goat cheese sauce. I had a great time making this dish. 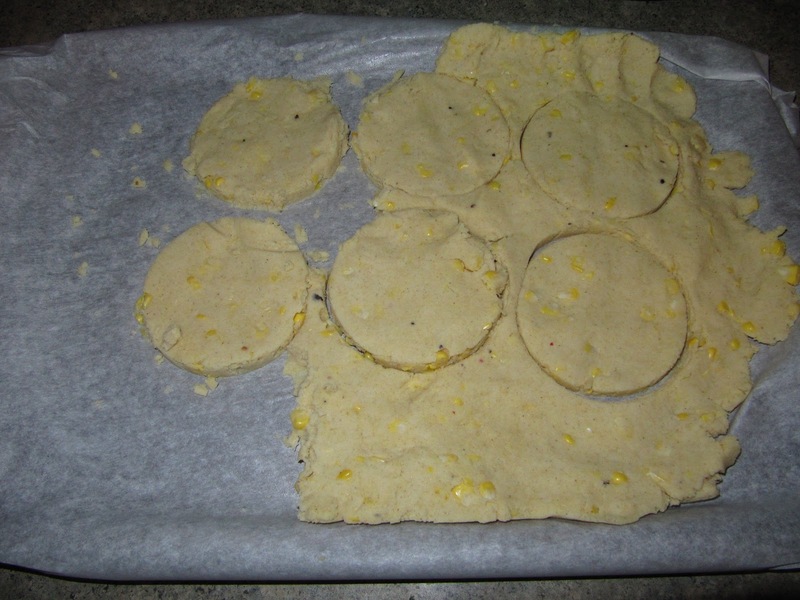 It was fun to experiment with an egg sauce and corn biscuits. The flavors complimented each other well and the dish overall was very enjoyable, something I definitely will be making more often in the future. Looks really tasty; the bright color of the sauce is awesome.